Before and after -- 'A Trip Down Market Street,' top; 'San Francisco Earthquake & Fire' below. These films bracket disaster. 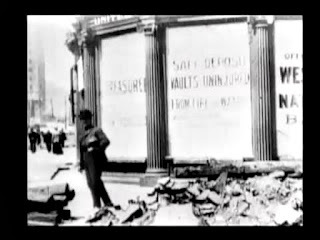 The 7.8 tremblor killed approximately 3,000 people and destroyed 80 percent of San Francisco. Only chance preserved a film made a few days before of the city, giving history an astonishing before-and-after portrait of the event. 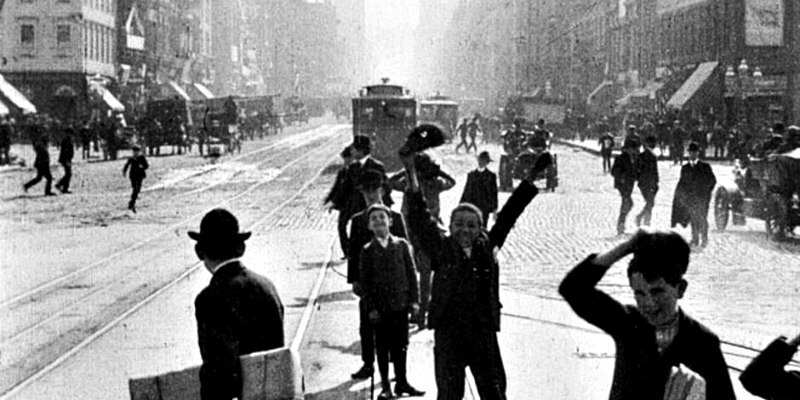 Thanks to the diligent scholarship of David Kiehn, it seems that filmmaker Harry Miles got onto the Market Street cable car sometime between March 24 and April 14, 1906, and rode it to the end of the line, cranking the camera as he went. These early “actualities” drew lots of viewers and were replicated in many American cities of the time. On his second try (he and his brothers tried driving in a car but got too much vibration) he made it. 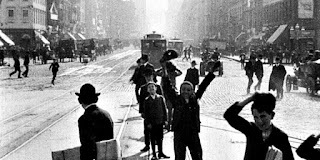 For the first time, it appears that people on the street know what a movie camera is and react to it. The medium is recognized and factored into everyday life, and the Age of Self-Consciousness begins. People peer, wave, look over their shoulders at the camera. In fact, this actuality is a bit staged. Even this early, civic boosterism is at work. The large number of cars in the film don’t represent the true state of things; many cars come around again and again, passing the camera to make the street look busier. On April 17, Harry and his brother got on a train for New York with the footage. When they heard about the earthquake, they sent the footage on and returned to shoot footage of the ruined city. It’s unknown whether the Miles brothers shot any of the post-quake footage that was preserved. What constitutes this film is a hodge-podge of material from all over the burnt district, shot at various times in the weeks following the destruction. It’s the first spontaneous documentary use of film, and a powerful demonstration of what film could do in this respect. The camera pans over piles of smoking brick. Walls are pulled down. Refugees stand in the street. Again, the filmmaker dresses up the unvarnished truth by staging a meal in the open air; sententious intertitles further diminish the experience by imposing a contrived narrative on it. Refugees leave, arrive; the rebuilding begins. This post-quake footage would do much to increase the perception of film’s power to capture a fleeting event, to convey emotion (earnestly or no), and, oddly enough, for the written word to tell us what we are seeing, and why.